Did you know that the possibilities to make a full QGIS back end solution for quality assurance and archiving in PostgreSQL are immense? SQL has it’s well known limitations, but with a little bit creativity you can make quite nice solutions just using triggers and rules. In this post I’ll explain what we did lately based on a project with a customer. He needed to assure the consistency of data but still give his employees the possibility of a fast feeding of the data collected on the field to the database. Another request was to keep every status of the data with the information about the changes (archiving). It’s always the question, where to put the logical part of the solution. QGIS is quite powerful with constraints, but the undeniable advantage of a back end solution is, that you can use any front end – no matter what configuration you have on QGIS or what Feature Manipulation Engine (FME) you use – without influencing the guarantee of data validity. At least for that customer we got lately. The customer owns pieces of land all over Switzerland. On this pieces are forests and in the forests are – as expected – trees. Well, mostly – if you are not a bark beetle or a squirrel – you don’t care about a single tree. Except if there is something special with it. For example, a branch that could fell down on your brand new Citroën DS or if the tree has a disease that could kill the whole forest, that is actually needed to convert the carbon dioxide (from your DS) into oxygen. The issuetrees (yellow) lie on the forest (green) – and the forest lies on the land piece (brown). And the (Entity Relationship Model) ERM looks like this. A land can have zero, one or more forests – and a forest can have zero, one or more trees with issues. 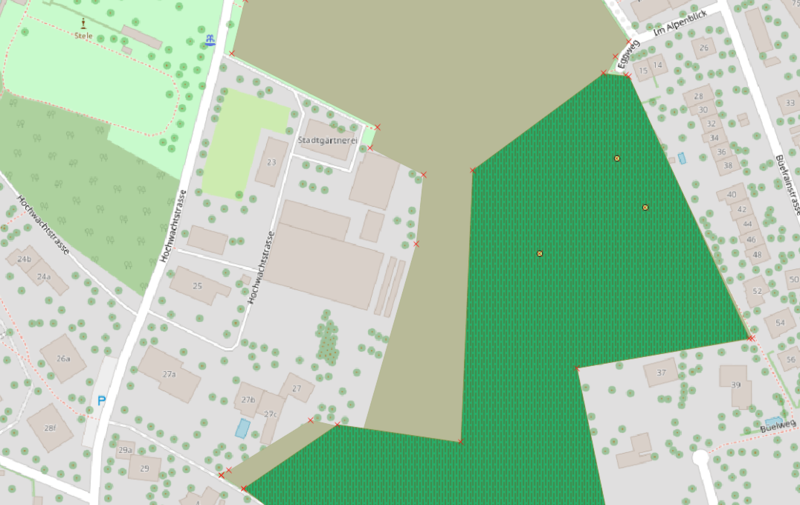 The situation is, that a lot of field workers (so called tree-inspectors) work with our mobile solution QField, where they can collect the data while standing in the middle of a wild forest with one foot in a rabbit hole and the other one in the stinging nettle. It’s quite possible and usual that there can be some problems entering all the data correctly. Typing issues on the tablet while running away from wolves or just lack of concentration because of the beauty of the swiss forests. But there are not only the tree-inspectors. There are the office-clerks working with QGIS and planning, when the problems on the tree has to be solved. And finally there are the woodsmen solving the issues and setting the status to done on QField again. So there have to be a lot of projects using the same data but with different configurations. If you make all the quality assurance on the front end you won’t have time to care about the trees anymore and beside of that it’s fault-prone. There are simple constraints like that a field is not empty and more complex constraints with a lot of logic regarding the content of the field. Lots of data integrity issues can be solved by using simple constraints like NOT NULL (column must not assume null), UNIQUE (column must be unique among all the rows in table) or Primary Key and Foreign Keys constraints. For more special cases or not really technical constraints, we can use checks. Here for example: If the issue is done, then it needs to have a donedate. But not if done is not TRUE (NULL or FALSE). And if these cases are more complex and not technical at all, we can put it to a function and use the return value (for example the error message) as condition. In the following example we want to assure that assignee is the name of one of the employed woodsmen. Of course it can be NULL too. Let’s imagine that the tree-inspector collected all day data in QField. Standing in the middle of the mentioned stinging nettle and rabbit holes, running from wolves etc… Of course he made some mistakes while collecting data. In the evening he returns tired to the office, already thinking about the dinner meal his wife is cooking (or his husband, of course), and wants to upload the data from the QField project to the database. And what happens? Lot’s of error messages. He thinks about to solve them tomorrow, because his wife (or his husband) can get quite angry when he is late for dinner. But if he does it tomorrow, the data are only stored on the device and nowhere else overnight. He need to have them in the database. No matter, if correct or not. And this leads to the idea of the “data quarantine”. All data entered to the database (valid or not) need to be stored. The entries accepted from the so called live tables with all constraints, are stored normally. The entries failed because of the constraint, are stored in another table. In the so called quarantine table. So you have for every live table another quarantine table. This means, we need another table structure existing parallel to the live tables. 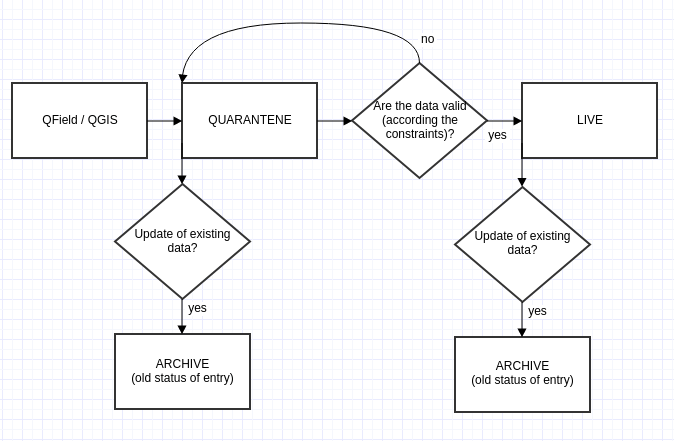 We do it in two schemas: The live schema and the quarantine schema. So the tree-inspector synchronizes his QField without any problem to the database. The correct entries are written into the live tables. The incorrect into the quarantine. Actually all the data are coming into the quarantine and there is a Trigger passing them through to the live table. If they success, they will be stored in live and removed from quarantine. Otherwise they keeps staying in the quarantine. Same situation when the quarantine-clerk later corrects the data entries in the quarantine. On an update they are pushed into the live-table. If success, all good. Otherwise the entry keeps staying in the quarantine. Insert the same entry into the live table. If success, then delete the entry in the quarantine table. Else write the info to the current entry in the quarantine table. In PostgreSQL we can use trigger functions. Means you have the triggers on the table calling the functions. And this is the function with the logical part with success and failing. As you can see, we use here an id called quarantine_serial. We can not use the primary key in the quarantine, because here everything is accepted and so nothing of the entered data (not even issuetree_id) has to be be unique. But to identify the entry in the quarantine table we create the serial quarantine_serial. Actually the trigger function before is not usable. Because it works only to insert new data into the live system. Now we remember the use case. The trigger here in the quarantine does not know if the tree-inspector created a new issuetree or updated an old one. On synchronization he made an INSERT INTO to the quarantine with all entries. But these could be new entries (new trees) or already existing ones in the live table. So the trigger function has to decide, if it’s an insert or an update on the live table. The yellow points are the issue trees in the live. If we create another one and have a mistake in it (GPS Id wrong), then it’s stored in the quarantine (pink). When we correct the data it’s written over the quarantine trigger into live. If succeeded, the point changes the color to yellow. Actually the yellow point appears (live) and the pink point(quarantine) disappears, because the entry is inserted into live and deleted in quarantine. When the woodsman cuts the last bamboo tree of the forest and this was the only food for the very last living panda bear of Switzerland, we need to know who created or changed this entry in the database and what tree should have been chopped down instead. So we created a third schema parallel to live and quarantine. The archive schema. This means every table in live does not only have a quarantine table accordingly, but also an archive table too where all the old status of entries including the timestamp, when it has been archived. Of course not only the changed live data are stored in the archive, but also every changed data from quarantine. The tree-inspector enters an entry of an issue tree that already existed in the live table to the quarantine (1). The after insert trigger is fired and it tries to write to the live table. And with success. The entry is written to the live table (2). This means, before the entry in live is updated, the old one was copied to the archive table (3). Then in the same transaction the entry in the quarantine is deleted (1). Means the old status is copied to the archive too (4). So there will be the updated entry in the live-table (2), no entry in the quarantine-table (1) and two entries (3 and 4) in the archive table. The tree-inspector enters an entry of an issue tree that already existed in the live table to the quarantine (1). The after insert trigger is fired and it tries to write to the live table. And it fails. The entry in the quarantine will be updated with the error-message (2). The old status is copied to archive (1). The office clerk makes no the changes to this entries. The trigger is fired and this time it could write into the live-table with success (3). So the old entry is copied to the archive (4) and after deleting the entry in the quarantine, there will be the second old status of quarantine (5) in archive too. So there will be the updated entry in the live-table (3), no entry in the quarantine-table (1 and 2) and three entries (1, 4 and 5) in the archive table. Insert a copy of the current entry into the archive table with the status it had until the update we are doing right now. It’s the same code for the live and the quarantine table triggers. So only the ones for the quarantine are explained. That’s what I just needed to tell you. It was a very interesting project and I liked working on it. Thanks for reading so far. If you have questions, improvement suggestions or anything else to tell me, then please comment it. * when saving multiple layers (that could be multiple updateable views on data having constraints), data is not saved in a single database transaction, which could lead to inconsistent intermediate states. * all business logic needs to be implemented on database level (i think that’s a bit the case with all GIS solutions not only QGIS? ), there is no application logic layer that sits between the DB and the QGis client. In some cases this is limiting for more complex scenarios. When this mode is turned on, all (postgres) layers from the same database are synchronised in their edit state, i.e. when one layer is put into edit state, all are, when one layer is committed or one layer is rolled back, so are the others. Also, instead of buffering edit changes locally, they are directly sent to a transaction in the database which gets committed when the user clicks save layer. Note that you can (de)activate this option only if no layer is being edited in the project. Probably it could improve the solution on saving data on multiple layers. Regarding business logic you are right. Anyway there would still be the possibility to have functions in PostgreSQL and you call them with QGIS user-defined actions. So you’ll have the logic on database level, but not in the back-end part of the database. I didn’t know this functionality but it looks like it would essentially solve the first problem i have, so i will try it out, thanks for the suggestion!